Charlestown Lady Pirate Volleyball (5-6 & 3-2 MSC) hosted the North Harrison Lady Cats Thursday evening in the CHS Sports Arena. 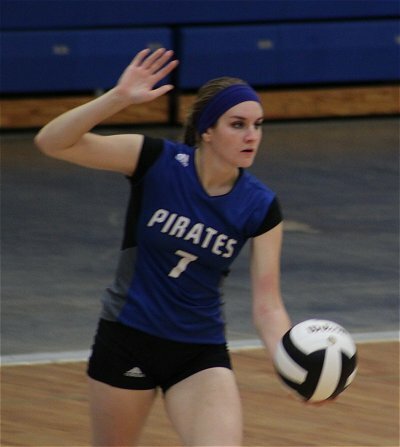 North Harrison, the 2015 defending conference volleyball champs, and winners of four of their last six matches; is a team the Lady Pirate Volleyball program hadn’t beaten in over at least six years. That changed Thursday evening, as Charlestown dropped the first set 18-25; before storming back to win three straight sets and the match 25-23, 25-13 & 25-19. “We have a great win against a good conference team tonight. Although we had a slow start in the first set, we were able to battle back and gain momentum as we played. Our win was a total team effort. We served well tonight which kept North Harrison from getting the ball to their key middle hitter”, commented Head Coach Tammy Nuxoll. Amelia McCoy was a key server for the Lady Pirates; establishing a 4-0 lead the third set and an 11-0 lead in the fourth set. McCoy also ended the night with seven aces. Kaia Reid let the offense with 12 kills, while Amelia McCoy and Hannah Thibideau each had five. Hannah Thibideau was also able to get her hands on some blocks that helped slow down the Lady Cat middle attack. Hannah Vincent led the Charlestown defense with 12 digs. “Tonight was a good win for us, and I’m proud of all the players for staying focused and supporting each other. This is a good win for us as we go into a tough Jeff Invite on Saturday”added Coach Nuxoll. The Lady Pirate Junior Varsity team improved their record Thursday evening, also defeating North Harrison 25-22, & 25-18.